1 of 4 Heat oven to 350 degrees . 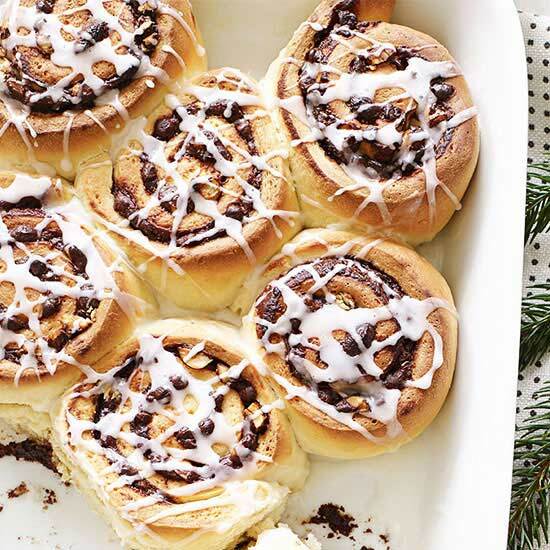 Coat a jumbo muffin pan with nonstick cooking spray. 2 of 4 Combine butter and chocolate in a medium glass bowl. Microwave for 45 seconds, then stir until smooth. 3 of 4 Whisk in sugar, then egg and egg yolk. Whisk in vanilla and sift cocoa powder over mixture. Fold in cocoa with a rubber spatula; stir in mini chips. Divide among 6 prepared pan indents (1/4 cup in each), spreading tops level. Bake at 350 degrees for 15 to 20 minutes, until tops are shiny. 4 of 4 Run a knife around edge of cakes; remove from pan. Cool a few minutes on a rack; transfer to plates. 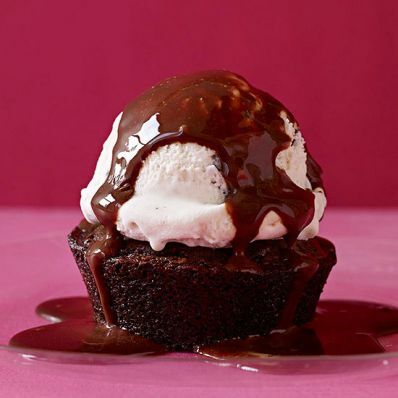 Top each with a scoop of ice cream; drizzle with chocolate sauce and serve. Per Serving: 3 g fiber, 7 g pro., 52 mg sodium, 493 kcal cal., 26 g Fat, total, 106 mg chol., 16 g sat. fat, 62 g carb.